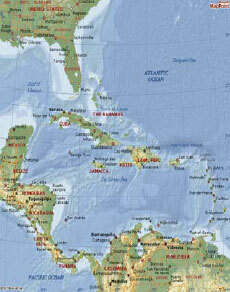 The Garifuna people live on the Caribbean coastal regions of Central America. In contemporary Honduras the Garifuna culture is a vibrant combination of resilience, independence and community commemorated through music, dance and story-telling. Their story is an extraordinary tale of survival, adaptation and endurance spanning two continents and 350 years woven through a history of colonial clashes as European powers set about seizing and exploiting the new world of the Americas. Central to Garifuna culture and identity is the history of their Diaspora: their origins in Africa, their forced departure to the Americas, their escape following a shipwreck off the coast of Saint Vincent, an island in the Caribbean, their intermarriage with indigenous Arawak Indians and Carib Indians, originally from South America, their eventual expulsion from Saint Vincent to Roatan, an island in the Bay of Honduras, and their final settlement on the mainland where their ancestors spread along the Caribbean coast of Central America. Today in Honduras the Garifuna people survive as an intact cultural group with a distinct language and set of cultural practices and beliefs. Garifuna communities are located primarily on the northern coast of Honduras in villages such as Trujillo, Ciriboya, Limon and Tocamacho. The soul of our people is ancient. From those few, we have grown to be many. We are the past, the present and the future. This is the essence of a Garifuna Being. *Cheryl Noralez is President and Founder of the Garifuna American Heritage foundation. She spearheaded the first Garifuna Community Forum LA 2005. She was born in Punta Gorda, Belize and lived briefly in Seine Bight before migrating to the United States as a child. Over time Arawak, Carib and African people and culture fused, creating the Black Carib culture –- a unique blend of Caribbean, South American and African music, dance, and spirituality. In the early part of the 18th Century French settlers arrived from Martinique to cultivate cotton, cacao and indigo. Following the Seven Years War (1756-1763) described by Winston Churchill as the first world war as it was the first conflict in human history to be fought around the globe. Prussia, Great Britain (including the British Colonies of Nth America) and Hanover were at war with Austria, France, Russia, Sweden and Saxony. The outcome of the war was the Treaty of Paris which resulted in a series of complex land exchanges amongst European colonial powers, which included lands in North America, (thus preparing the way for the American Revolution), and in the Caribbean. Included in the Treaty under Article IX was French recognition of British ‘sovereignty’ over the island of St Vincent. The English planned to commence large scale sugar plantations on St Vincent and began attempts to pry the Islanders off their land. In 1795 war broke out between the Garifuna, led by the legendary Chief Chatoyer (or "Satuye") and the British. Eventually, after two years of war, the British overcame Garifuna resistance with massive troop reinforcements from Jamaica. In 1797 thousands of Garifuna were once again rounded up, forcibly loaded on to ships and deported from their homeland. Eventually the British put them ashore on Roatan, an Island in the Bay of Honduras. According to Garifuna oral history, the Garifuna did not like Roatan. Some established Punta Gorda, the oldest continually inhabited Garifuna community, but most traveled to the mainland. There they survived and prospered and, over time, Garifuna communities became established in the coastal northern regions of Honduras, Nicaragua, Guatemala, and Belize. Today, 210 years later, the Garifuna people survive as an intact cultural group with a distinct language and set of cultural practices and beliefs. Many Garifuna live around the Bay of Honduras, in urban communities and rural villages in the coastal towns of northern Honduras, southern Belize and Nicaragua, the coast of Guatemala around Livingston and on the island of Roatán. 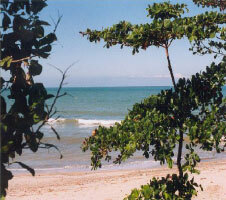 Many Garifuna Honduran communities are located on beautiful undeveloped coastal land with expansive beachfronts looking out over the Caribbean Sea. Garífuna have lived in these specific areas of Honduras for the past 200 years and they have petitioned for title to those lands for years now. In Honduras Garífuna have long faced discrimination and have had to struggle for political, social and economic equality. Many rural Garifuna villages are still without electricity and other basic services. They are remote with limited access to communication and transport systems. Retention of their land rights is critical to the future of Garifuna communities and their culture and identity. Many of the core Garifuna religious and cultural practices are inextricably linked to the land. The growth of the tourism industry threatens to undermine their way of life and encroaches on what they regard as their ancestral lands. Under article 107 of the Honduran constitution the land rights of indigenous people, including Garifuna peoples, are theoretically protected. Article 107 stipulates that a foreign company cannot own land within 40 kilometers of coastal lands. Pressure is intense from developers and other powerful business interests which expect to benefit from major tourist projects and demand for beachfront property. Tactics from land invasion to intimidation and other unscrupulous methods are utilized in attempts to pry Garifuna people from their lands. Sometimes the government has either ignored the law or found ways to get around it. The Garifuna struggle for self determination continues. Honduras’ new president, José Manuel “Mel” Zelaya Rosales, won power in the elections of November, 2005 with promises to protect the rights of indigenous people. These promises were hard won by active indigenous groups, but the outcomes remain uncertain. Although, with globalization, there are many pressures on Garifuna communities, and the power to determine the future of their culture and identity, the truly extraordinary history of the Garifuna people tells a story of a resilient people making their own history and triumphing in the face of enormous odds.